Dartmouth Regatta 27th, 28th and 29th August 2015. This is a major traditional Town regatta with a lot of events happening apart from the sailing, both on and off the water: including 2 magnificent fire work displays, 2 air displays including the Red Arrows, at least 2 live music events most nights of Regatta week, fun fair, local and regional rowing competitions and lots more. A new fleet of 4 or 5 J24’s has become established in Dartmouth, South Devon this year and 3 intrepid Plymouth J’s undertook the 6 – 8 hour voyage around the coast to join them at this year’s Dartmouth Regatta, over the August bank holiday weekend, while several of the top UK boats were making the mammoth road trip to Germany for the World Championships . After carefully studying the weather forecast and tide times, the 3 Plymouth boats Italian Job, Unity Lets and Hijinks decided to make a run for it on Sunday 23rd instead of the Wednesday before the regatta was due to start on Thursday 27th August, due to the severe weather forecast for Wednesday. Thanks to quick launching by the Plymouth QAB marina staff within an hour of being asked, we enjoyed a spinnaker run all the way in glorious sunshine, 10 – 12knots wind and with the tide all the way, we did the trip in 5 hours, to take up our mooring spot for the week in Dart Haven Marina on the Kingswear side of the River Dart. (We were right – the IRC boats and cruisers who did the trip on Wednesday had a rough time)! The 7 J24s entered were put in the “small non IRC“ handicap class (in hindsight probably much to the dismay of the non J24 boats, see the results below). 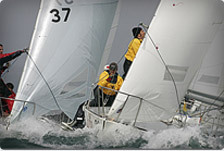 The Regatta Organisers laid on 3 course areas in order to separate out the different boat sizes and classes, with 2 races scheduled per class per day over Thursday, Friday, Saturday and Sunday. Day 1: The first day of racing dawned, a bit grey but dry and with the forecast 14 – 18knots of wind SSW, gusting around 22 at times. Our course for the 2 races today was a triangle-sausage –triangle course. There was a strong tide running out in the Start Bay race area, pushing boats onto the start line, which caught out several keen starters in most classes. 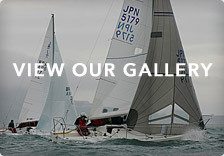 All j24s started on genoas. after 3 eventful laps with the challenging reach- to-reach gybing catching a few out on the first lap, John Gorman and his crew on Italian Job took the first race for the “away” trio, with well-known local sailor Mike Mackie sailing Jiggy2 in 2nd . Several boats changed down to jib for the 2nd race as the breeze strengthened a little. Mike Mackie prevailed to take the win, with John Gorman in 2nd and Matt Conyers in Unity Lets in 3rd. On countback this put Mike Mackie in the overnight lead and winning the day prize. During the day there had been several broaches and some sail damage, particularly on the larger IRC boats on the other courses and a couple of reports of sea-sickness were heard over the radio. Day 2 provided similar conditions on the water and the same course as yesterday, with all crews keen to get underway and helped by the tide the first race of the day saw a general recall and the unfurling of the infamous black flag! After a bit of re start jockeying and tide Italian Job unfortunately fell foul of it and scored a BFD with overnight leader Jiggy2 finishing in 5th. The race was won by last year’s class winner, Rhubarb (a very well prepared and sailed Salty Pup 23), with local J24 “Area 51” sailed by Lee Rogers and Matt Greenhalgh 1st on the water but 2nd on handicap and Unity lets in 3rd (this was the 2nd and last time a non J24 featured on the podium on the water or handicap). Race 4 provided another tight battle between Jiggy2 and Italian Job, everyone had got the hang of dealing with the tide and starting close but still on the right side of the line, eventually going the same way as race 2, with another win for Jiggy2 and Area 51 in 3rd, with Mike Mackie holding on to the overnight lead and Area 51 winning the day prize. Back to more excellent hospitality in the event marquee and Royal Dart Yacht Club and the first of the 2 magnificent firework displays later in the evening. Day 3 dawned with bright sunshine and a forecast of light wind. The Race Officer kept all competitors ashore as the tide was stronger than the wind out in the bay, with a 2 hour postponement which eventually resulted in abandonment of racing for the day, allowing crews to cross the river into Dartmouth town and sample the other activities and entertainments on offer. And also make their own entertainment such dredging around a boat at low water for a dropped tension gauge, success was greeted by much applause from the gathered crowd! (thanks for the dry suit Matt, and no it was not me who dropped it). Day 4: again rather grey with some drizzle which soon got blown away but this time wind from the NE, so with the tide. The tide starting off slack and building as the day progressed. A windward-leeward course today – 3 laps with a windward spreader mark introduced. A close fought race with Italian Job doing an excellent job to win, Matt & Darrel Conyers 2nd in Unity lets, Area 51 3rd Hijinks with their progressing novice crew 4th and overnight leader Jiggy2 had “one of those races” – best forgotten but managed to hold on for 5th. So with all resting on the last race and the discards confusing the picture, race 6 got away OK so we thought, there was a 3 boat sandwich incident at the windward mark which saw Area 51 and Hijinks pushed down the race order, only for the race to be stopped before the end of the 1st lap due to a massive wind shift. A big relief for Area 51 and Hijinks! On the re-start, Hijinks spotted a significant pin end bias and performed a classic port tack flyer, watching the rest of the fleet bunching up and squabbling around the committee boat and established a nice 4 -5 boat length lead from Italian Job, then Unity Lets and Area 51 followed by Jiggy2. These positions were held on the run and up the 2nd beat. By this time the tide had set in so the windward mark was going to be a bit more tricky. To add to the excitement, the windward mark had drifted down the course a little so the spreader mark was now upwind of it – not spotted soon enough! Disaster for the leader – touched it, lost the lead during the penalty turn and then got caught out by Unity Lets at the spreader next time around on the last lap. So a well deserved final race win for Italian Job (team song: we are the self-preservation society!) and also winning the day prize and the series firmly settled in their favour. Unity Lets 2nd and Hijinks 3rd, Jiggy2 4th and Jaxxiva in 5th . So well done to John Gorman and his seasoned crew on Italian Job for winning the series. Well done also to Mike Mackie and his crew on Jiggy2 putting up an excellent performance in their first regatta against more experienced j24s with 2nd over-all, to Unity Lets in 3rd, who were sporting a crew including 3 generations of Conyers family with Lily aged 11 and Alice 15, and another local boat Area 51 in 4th. 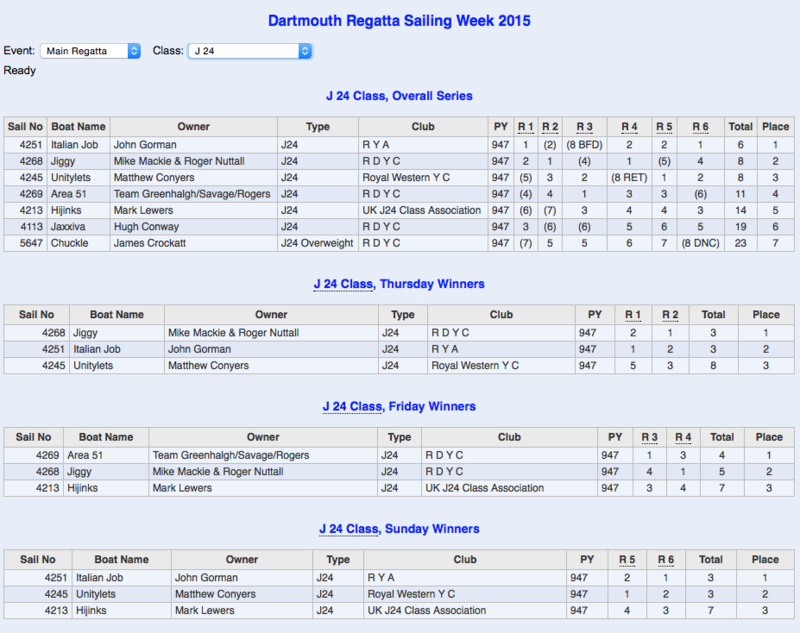 As you can see from the results below – the 7 J24s took 7 of the first 8 places in the class overall on handicap as well as having excellent competition amongst themselves. This just goes to support the J24 being an excellent tough and enduring little boat providing plenty of challenges and fun for both experienced and less experienced crews, of all ages. For the Plymouth trio the finale of the splendid weekend was a bank holiday Monday sail back – sun, following tide, spinnaker run round Start Point then reach as far as Salcombe, genoa beat into Plymouth – 6 hours. A big thank you to the Joint Regatta Sailing Committee, Race Officers and many helpers, Royal Dart Yacht Club and the Dartmouth Yacht Club, Dart Haven Marina, and the catering staff in the Marquee (a family firm who had roped in other family members to take holiday in order to help for the occasion) – a sterling job over 5 days providing breakfasts through to suppers and late night shandies. Off the water, discussions were started with the hope of establishing a J24 spring event in Dartmouth. Lets hope it comes to fruition.